Thanks to lots of people. Annie and Karen for letting us go. Derek in LA for sorting the car. Javie and Joe for keeping us going and to all those other cars for help with tools and parts. Webmaster Mark for sorting our website. The final toll on the cars was 19 DNF. The car has travelled 6550 miles in just over two weeks. 364 days to 2007s race!!! Nov 17 - 5130 miles: Final 300 miles to border. We pack up after the awards dinner. Check out and manage to palm off our spare wheels and box of spares onto Rachels Lotus. It will all arrive in LA one day...... We load the bust engine into the passenger seat and put it all onto Javies trailer. Drive the 300 miles up to Neuvo Laredo. Give away all our last pesos to Javie, join the queue for bridge 2 and wait. An hour later we find out that we need 25 pesos to cross over ( but give away a signed photo-card of the car instead) and then are told that everyone must be in the car with the luggage...or if not to join the foot passengers on bridge 1 ( 2 miles away) Given that the spare engine is now inside the 2-seater we manage to put all the cases on the roof and Conrad/Joe hang onto the doors as we cross into America. The car is left in a hotel carpark ready to be picked up to go back toLA. We struggle for 40 mins to find a taxi to get us through Laredo and finally catch the flight in Laredo with 5 mins tpo spare.... and fly back to find Annie and the boys at Gatwick. PS A HUGE THANKS TO JOE AND JAVIE FOR GETTING US TO THE END!! DAY 7 ..... FINAL LAP. Nov 16 - Day 7 - miles 4830: Adrian Stevens to drive the last leg. We go back up La Bufa. Adrain beats Conrads previous day tme of 7:48 with a 6:52. The orange 356 does it in 7:14. Then with only two stages to go we blow the engine. A valve has disintergrated in the engine with about 400 miles to the finish. We have to decide whether to be towed over the line with no time penalties or to change the engine at the side of the road ( approx 4 hours) and to drive the finish line. This would mean that the 2 min 30 sec penatly would probably keep us in front of the orange 356. 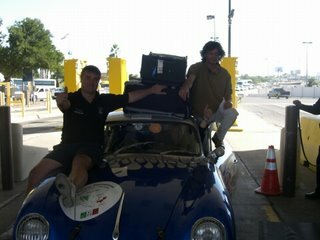 After 6 days we feel we should drive to the line so we pull into a petrol station and drop the engine out. Joe and Javie are stars and get it turned around in 2h40m and we push on the finish. In Monterry there is the usual end chaos. The track stage was cancelled and all the cars are all over the place. We get our 2:30 time penalty and the orange car stays behind us in the final listings. We are 3rd in class to actually cross the line, though the Clark/Prill car has technically beaten us on a trailer by 20 secs. We are the first finishing 356 out of the 4 that started and including the 3 911s are second finishing in the group of seven Porsches. In the final print out we are 25th overall. They do have a strange habit of lowering the faster 1965+ cars out of the overall classification - but we dont mind!! Sam our friend wins his class and is 5th overall. The famous Jo Ramirez (ex McLaren) asks to be photograhed with Conrad and Joe.!?? After 7 days we are all exhausted. DAY 6 CONRAD TO DRIVE "LA BUFA"
Nov 15 - Day 6 - miles 4450: We drive from Aguaclientes to Zacatecas. Four speed sections. We have a 7 minute cushion in fourth class position to the orange 356 that is behind us. Conrad starts off well and drives safely over the first two sections. We slip 27 seconds in the first section but gain back 17 seconds on the second section. Then we move onto La Bufa for an uphill section to the top then the reverse down. 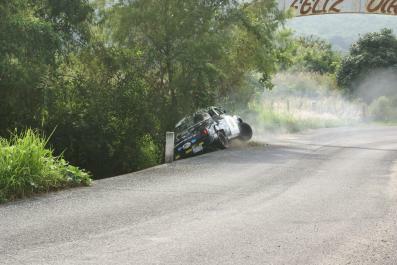 La Bufa is a very fast straight up hill section of 10.3 kms withnothing worse than speed2 corners. The fastest cars can get up to 150-160 mph on he down section straights. In the first two sections they beat us by 12 seconds then 41 seconds. We come into the biggest crowds so far - thousands of people - all the cars park up in the main square. The orange 356 gets the class award in the evening for third in class. We were fourth. Overall we are still 4th in class holding a 6:30 lead over them going into the last day. The 3rd placed 356 is now within reach tomorrow and IF we can keep the orange car at bay we might get third in class on the final podium....but thats a long way off. At 8.00 we all get together for a tequila crawl through the town following a band to the dinner. We will check the car in the morning and adjust it to allow for the fall from 7,500 feet to sea level after the first stage. Tomorrow we go up La Bufa again then two more speed sections finishing at Monterry speed track. DAY 5 BACK TO MIL CUMBRES AND MORE PRIZES!! Nov 14 -Day 5 - 4300 miles: We saw someone getting their new car blessed yesterday evening by the local priest in full gear. Javie says its the norm..maybe we should get round to the local church to get all the help we can get! Despite the accident on Mil Cumbres we go back to do it in reverse. The conditions are much drier and we put in some really good runs especially on the downhill sections. 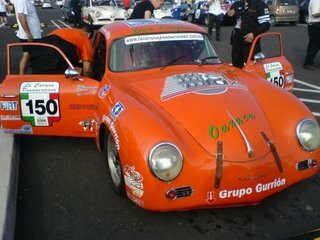 The orange 356 is still ahead of us in the overall class standings. We lie 4th in class after the Clark car exited yesterday. Over the stages we manage to pull back over 7 minutes on the orange car. This puts us as 3rd fastest in class today and up the 4th in class overall. For the second evening we are on the podium at prize giving. The tortoise is creeping up.!!!! We are now 63/88 overall 4/10 in class. Nov 13 - Day 4 - miles 3900: All well with the car...now for the big one. ........Mil Cumbres. Conrad in the driving seat. 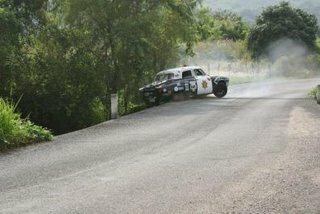 The daunting Mil Cumbres - a speed stage that has slippery roads, no edge barriers and often landslide gravel on the road. We are again warned in the drivers meeting that the hill has to be respected especially with the recent rain. 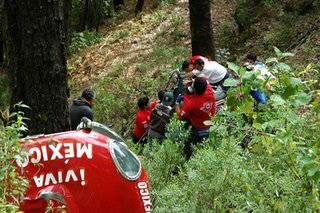 We get off to a great start and put in good performances on all the stages by the end its raining and the final stage on Mil Cumbres is brought t o a halt because of a terible accident. The road has suffered landslides and in at least three parts of the 17 km section literally half of the road has slid down the mountain leaving a giant hole. We spot the Clark/Prill 356 at the side of the road with a broken cam shaft. 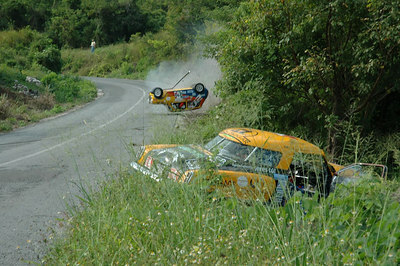 Both the second place Studebaker and the E type crash on the stage with both of them going over the edge. The studebaker is fine - but out. The E type has gone down 60 meters and the driver is hospitalised. The final stage is cancelled and we return home after a long delay due to the incident. On the way back to the hotels Conrad crashes again!! This time with the trailer hitting a tree in the town square.....At the drivers awards we have climbed into 3rd fastest in class for the day, 4th in class and 66th overall. 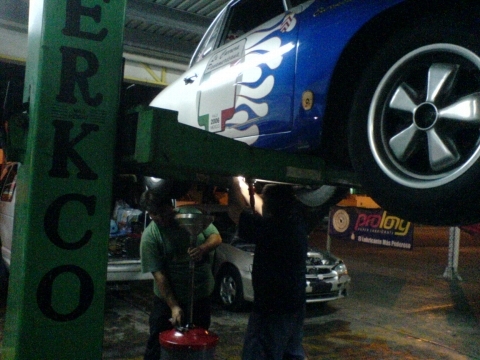 The car is worked on all evening and has its valve clearances adjusted. 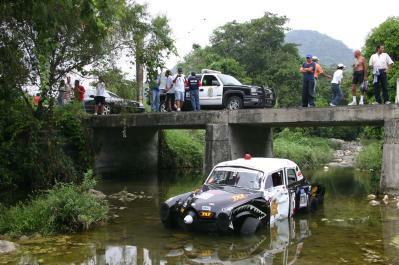 Nov 10 - Day 1 - 3050 miles: Two of the speed stages are cancelled due to dangerous road surfaces. The mini that rolled yesterday is back with a plexiglass screen. The 80 or so cars get into start order and move out from the park fermee to the sounds of Spanish rock music. Viewed by the crowds as if we are off to certain death. We drive out past the smashed wreck of the black/yellow car. 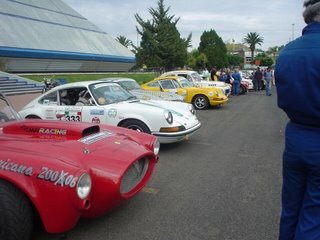 At the start line we queue up listening to the roars of the lead cars V8S echoing round the hills. Its extremely hot......We line up to start then break down on the start line. The fuel or starter motor is cooked. All the rest pass us and we are left to mend ourselves. Luckily Joe and Javie turn up,open the fuel lines - seem to release the pressure and we're off. We almost immediately pass the number 4 pole car of Churchills that has rolled 4 times ...and is out. 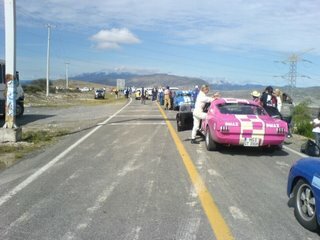 Also pass the alfa that started in front of us - stricken by engine failure. The roads surfaces are aweful. Conrad calls the corners and we get into a good rhythm. Before we know it its the lunch service break. In the afternoon stages despite the 30 second start gaps we overtake a Fiat and Jaguar. In the final stage ( yesterdays qualification one) we whizz over the two bridges - no sides of course - and glance down to see another studebaker 6 feet down in the water. At the end we swap over to let Joe and Javie drive back into Veracruz. We drive the van. They are mobbed by hundreds of kids who view them as mad 200mph racers. At the race awards two of our friends get class wins. Sam in his LT and the exhibition class Lotus Elise of Rachel "Goblin Girl"/Steve and Cade. Her Lotus sure moves and she has put in some great runs and Conrad loves her tattoos. Will he get one ?????. 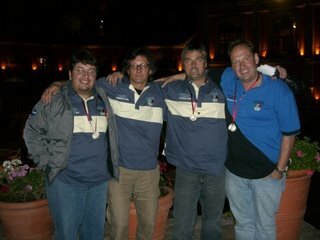 We get finishing medals and then the boys rebuild the starter motor and the fuel pumps until 11.30pm. BED!! !We are now in 50th place , 4th in class. Nov 11 - Day 2 - 3350 miles: Conrads turn in the hot seat!! He's just let on that he has dyslexia and doesnt know his left from his right. So have decided to put a big L and R on the back of his hands. As we set out nearly 6" of rain comes down - we werent expecting this so dont really have any wipers to talk about. The speed bumps were completely submerged and caused many problems. As we headed back out to the hills the roads start to dry out. Our petrol pump was playing up again - but ok this time. Conrads first run was exciting to say the least. At about 6,000 ft we were negotiating the bends well. He had the LH and RHS ok. But half way in at a vicious RH 2, with a valley on one side, we went off in a spectacular 180 spin. We smashed into a deep bank and both exited the car windows in a nano second - without even removing the nets! The most important thing was for Conrad to get out our red flag and to wave it at the next car that was due to pass in 30 seconds time - warning him. 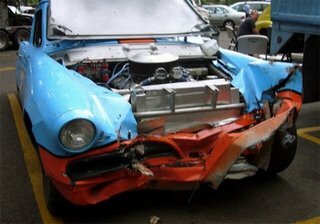 Sure enough an e-type came round at probably 70mph narrowly missing everything. Followed by two others until they closed the stage and sent down the medics and towtruck. We manage to push the car out and continued on with only a broken exhaust and Conrads pride dented. The next stages went well though we had to stop in a village at a workshop to have our exhaust pipes welded and a new rear section added ( very chav!). That evening we were again met in the town squares by thousands - all still wanting Conrads signature despite his off!!? To cap things off Conrad hits a car in the traffic on the way back to the hotel - slight dent on front wing, I wonder if Goblin Girl needs a new co-driver in the Lotus?. We have slipped back to 70th place but theres a long way to go. Nov 9 - Day 1 - miles 2700: HAPPY BIRTHDAY BARNY!!!! HAPPY BIRTHDAY TO YOU - HAPPY BIRTHDAY TO YOU - HAPPY BIRTHDAY DEAR BARNY - HAPPY BIRTHDAY TO YOU !! After we go to scrutineering to find out what happens about our fibreglass bonnett. They say we must be weighed unlaiden. 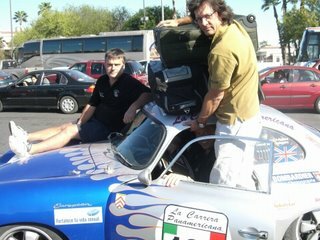 The car has to be a minimum of 901 kilos ( with a 5% allowance). We load in everything. An extra spare wheel/tyre, a giant bag of hammers and spanners, 20 bottles of water and all the helmets etc. The car goes up on the scales and comes out at 865 kilos. Phew!!! We are allowed to stay in our class. We set of to the hills for the speed section. Going off in 1 minute intervals with Murrays warning echoing in our ears. The 10 km section is very twisty and has two narrow bridges in it. 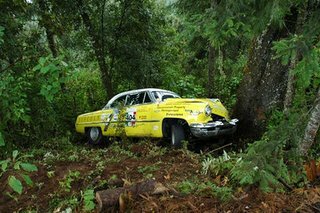 Half way round we come across a smashed black/yellow Studebaker. WOW !! We are timed out and return to Veracruz. It turns out that 3 cars crashed badly ..all being written off. Everyone inside safe. Our fellow racer "Coop" now to be known as "Toulouse" turns in a great time..... he's an artist and should repaint our car. We are posted with a slow time of 6:59 47th place. Incredibly the other 356 of Clark and Prill was almost a whole minute faster. But the Carrera 2 is behind us. So we have our start time orders for tomorrow morning. We are going back out to the same hills speed section with another 9 sections added. DO'NT WORRY WE'LL BE VERY CAREFUL. Nov 6 - Day 5 - 2650 miles: Wake up in Puebla surrounded by smoking volcanoes. 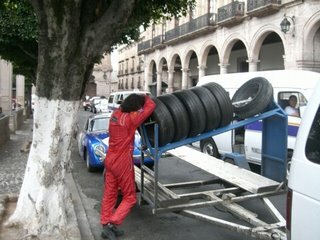 We had got the entire convoy lost last night, but luckily our Mexican team mate Javie knows the way. The city has been hit by flash floods with up to 8" of water. Raw sewage everywhere....nice!!!! Need to clean the car tomorrow. 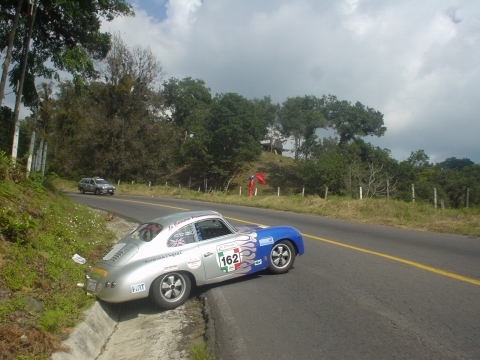 Decide not to work on the car in Puebla - so hit the road to Veracruz. Uneventful drive with amazing scenery as we finally drop down from 6,500 feet plateau to sea level. Drop the porsche down for more testdriving. Go chasing the 2006 Lotus Elise for 40 miles. The car runs very well. At 5,500rpm it is humming along just on 100mph with loads more torque in reserve. Run for about 10-15 mins at 100mph then the next hour at 4,00rpm at about 75mph. Coming into Veracruz we can smell petrol.........we check out the petrol lines to find a drip, which after a little crew adjustment turns into a fully severed line with petrol spraying all over the engine. Back onto the trailer and after a quick tour round a hypermarket to get cleaning stuff and off to find our hotel. Luxury - the same bed for the next 5 nights. Big day tomorow - new fuel lines, medicals, car and driver scrutineering. Nov 5 - Day 4 - Miles covered 2450: First job....under car and raise torsion bar up nearly an extra 5". Adrian cleans the car. Weather now very hot and sunny.We have been at altitude for the last three days at 6,500 feet. The 1000cc two-stroke 100bhp Saab driven by two Swedish girls is struggling with the thin air - its 3 cyclinders are always oiling up. 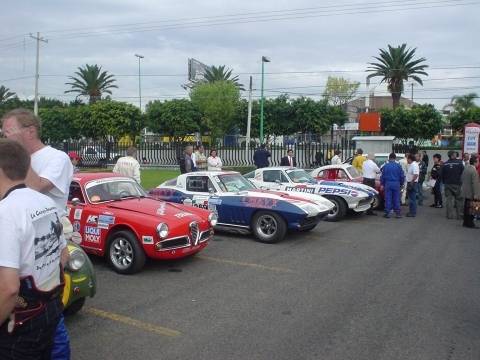 San Miguel throw a classic car recption in the main square for the "carreristas". 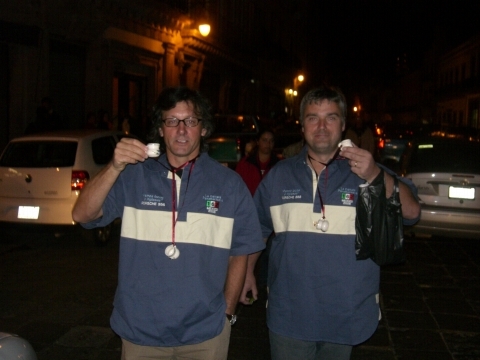 Joe and Javie drive the car up to it to find 2,000 people, mexican bands and hundreds of children seeking autographs. Adrian and Conrad sneek in via taxi and watch as Joe is mobbed by autograph hunters. He finally runs out of ink/patience and finds the Corona beers. His signed pr cards will probably be on ebay next week! We all move out at 7.00pm in convoy to go to Puebla via Mexico City. Drive for 8 hours in mist and rain. Unfortunately the Volvo 1800 throws a rod on the motorway and is out. We cant be last! but v sad... Join up with some giant rigs..these cars arent here to be second. Get lost in Mexico city and lead the 20 cars behind us into the same problem. After 3 police cars read our Govt letter we move out and climb out of the volcano edge at 10,500 feet. Finally get to Puebla after 8 hours driving. Nov 4 - Day 3 - Miles covered 2030: Derek flys back to LA with an office crisis. Conrad cabs it over the border. Joe and Adrian cross the border with the car, driving up onto the Mexican trailer after 800 yards and we all join the coyote convoy to drive the 680 miles to San Miguel. 12 hours non-stop in sheet rain. After 11 hours Joe and Conrad drop the porsche for a test run into the hills by San Miguel. They encounter the infamous "topez" speed bumps.....big problem....the car only has 3" front clearance. Tomorrows first job. Amazing hotel and reception by the town and free entry the their $us 150 tuxedo dinner reception. Nov 2/3 - Day 1/2 - Miles covered 1350: Derek and Joe drive the car,van and trailer 1350 miles in 26 hour drive and meet Adrian and Conrad in Laredo. C and A try to change sterling into $ and pesos...but the bank only allows $us 1,000 max so we offer to open an account, that eveing they dont venture into Nuevo Laredo to visit the famous Cadillacs bar after hearing there is at least one murder every day in NL. Early night for them!?. All the spares and spare engine are collected by our Mexican Mechanic/Trailer driver Javier. Car gets its tempory race visa after many hours waiting at the border ...bed at 2.30am. Nov 1 - Day 0 - Miles covered 0: Harvey from Weidman Wheels has saved the day. He was due to send down the 4 spare alloy fuchs wheels with our yokohama tyres by courier...but after being let down he drove them 9 hours each way for them to be at the LA workshop ontime the day before departure. WHAT A HERO!!! Thank you Harvey.